This month’s We Should Cocoa challenge is sugar free and with luscious dates as good as these, no additional sugar is required. Dates, are of course, high in potassium and packed full of goodness as well as natural sweetness. Just before Christmas, I’d seen a recipe in a Goodness Direct newsletter for Christine Bailey’s superfood truffles which I thought would fit the bill; not only did it need good quality soft dates, but also used a couple of ingredients I wouldn’t have thought of. As it happened, I adapted the recipe quite substantially: I left out the additional sweetener (raw honey) as a) I didn’t have any and b) although I could have substituted this with any number of other sweeteners, I felt the dates would be sweet enough without. I changed the quantities and used cashew nuts and goji berries rather than macadamias and cranberries; although I would have loved to have tried macadamias, I just didn’t have any. The recipe stated to roll the balls in cocoa powder, chopped nuts or desiccated coconut, but as they weren’t too sticky and I liked their speckled look, I left them unadorned. On a more practical note, CT reckoned they would be much less messy to eat this way. These truffles were so simple to make and unlike ganache truffles, I was not left with my hands and kitchen covered in sticky goo. They were also very tasty with a nice chewy texture. The flavour of chocolate was strong, but the taste of honeyed dates was not lost. The floral notes from the bee pollen were noticeable and a very slight bitterness from the maca came through too (despite maca being a reputed superfood, I haven’t enjoyed the flavour it brings and don’t think I will bother with it again once I’ve finished the packet). They are all together different from chocolate truffles, which are much more of a treat, but they are still satisfying when the craving for something sweet descends. CT’s comment was that they didn’t taste “worthy” as healthy foods sometimes can. I will most certainly be making these again and look forward to experimenting with different flavours and ingredients. I was sent a box of Medjool dates to try but as always, all opinions expressed are my own. Made from scratch as these were, I am sending them to Javelin Warrior’s Made with Love Mondays. As Dates were the main ingredient, I am taking D to mean Dates for Alpha Bakes with Caroline Makes this month, but alternately hosted by Ros of The More Than Occasional Baker. I am also submitting these to Bookmarked Recipes over at Tinned Tomatoes as I did, in fact, bookmark the recipe. Dates are currently in season, so this recipe also finds itself winging it’s way to Simple and in Season. An event started by Ren of Fabulicious Food, but this month hosted by Karen of Lavender and Lovage. 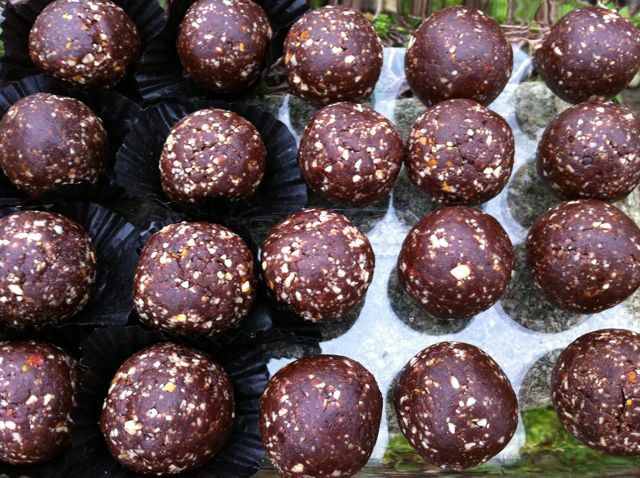 Healthy raw chocolate truffles with a chewy texture that taste of chocolate and honey. Place all ingredients into a food processor and whizz until combined. Roll teaspoons of the mixture into 20 walnut sized balls using the palms of your hands. Leave in the fridge overnight (I’m not sure this bit is necessary but it’s what the original recipe suggests). The truffles can be rolled in raw cacao powder, chopped nuts or desiccated coconut. I made something similar to those last year, I think I entered them into the almond WSC challenge. I found them just as addictive as conventional chocolate truffles but without the guilt that chomping your way through a box of chocolates brings. Yours look beautiful and I like the littles pieces of nut poking through. Oh, I’ll go back and check Jen, thank you. I find them great snacks that stop me craving more sugary foods. I love dates…and I like how you’ve made your truffles so big! Hehe CC, the theory is one large truffle should satisfy ……..
My mum loves dates, but I’m not that keen. I quite like them in dishes and cakes though. Truffles!!!! what can i say, so delicious!!!! I want one right now. I do like the idea of using dates to make raw chocolate desserts but have never tried it. These truffles look gorgeous – maybe this is where I’ll start! Oh do try them, you would make them look so beautiful. I’m sure you could leave out the more difficult to get hold of ingredients and they would still work well. looovely! You are very inventive Choclette! Dates and chocolate are a match made in heaven. I had them in Dubai long time ago.. I’d love to try making them myself! Do try them Alida, they really are very good. Were you living in Dubai or visiting? I would love to try these out but I have no chance of getting hold of some of the powders you have used. Do you think there are any substitiutes that could work? I love Medjool dates so much and know they would be a welcome flavour in any sweet treat! They look gorgeous! Laura, I expect you could make these with just the dates, nuts and cocoa powder – these are the only ingredients in Nakd bars (other than flavour). But lucuma powder is worth getting if you can, it has a nice custardy sort of flavour. Any good health food shop should stock it. You could always add some flavoursome dried fruit instead of the goji berries – sour cherries maybe? If you don’t use the powders, you may not need to add water or so much water. Or you could use some orange zest and juice and make it a #oneingredient! I thought about doing that myself, but can’t easily get hold of unwaxed oranges here. You know I have not yet tried a Nakd bar and didn’t realise just quite how good for you they are, much like these yummy raw truffles. So, it looks like lucuma powder is a worthwhile investment and I love the thought of adding orange flavourings to fit in with One Ingredient! Trouble is I have a hell of a month ahead of me, so I may only just manage a soup plus a post about my cookery lessons which seem to be coming in from everywhere. It can be a pain being busy, but how good that you are so popular and everyone wants you for teacher. Good Luck. That is a really innovative way of eating dates. I have never thought of mashing them up into a truffle with chocolate and berries and nuts. I have never seen some of the powders that you mentioned in the list. But I reckon the powders won’t affect the recipe if I do leave them out? The recipe should work fine without the powders, although I haven’t tried it yet (want to have another go now as I’ve had so many people asking) They are mostly there for health benefits and additional flavour rather than for texture. I did something very similar to this that I read in a Gillian McKeith book years ago – they were marvellous and I don’t know why I’ve not done them again since. Lovely! Hopefully this reminder will spur you on Sarah. They are the sort of thing that don’t stick in my brain – unlike cake! Very interesting variation on a truffle – they sound excellent. The chewy texture sounds very pleasing. People have tried to persuade me of the benefits of maca powder but I’ve noticed that they rarely mention the taste, so I’ve never tried it. To be honest Phil, I wouldn’t recommend the taste of maca at all as I find it too bitter. However good it’s meant to be for you, I don’t think I shall be buying any more of it. But taste is a personal thing, so it might be very different for you. Well I hope I’d get more than just this for my Christmas meal, but thank you. I’d be very happy with one of these to finish the meal off. Great idea – i’m on a more cocoa less sugar mission at the moment! I love the sugar-free theme and the use of dates to provide the sweetener. These sounds wonderful, Choclette, and while I don’t know that I’ve ever had medjool dates specifically, I love dates in general and I keep looking for new ways to use them. Thanks so much for sharing & very creative! Thanks JW. Do try medjool dates if you ever get the chance, they are heaps better than your average dried dates – or at least better than the average dried date you find over here in the UK! These look amazing though I’ve never heard of half the ingredients (some googling is required I think – mesquite powder for instance). And where on earth did you get bee pollen – can you buy it, or do you keep bees? Thanks for entering this in Alphabakes! Hi Caroline, sorry to take so long in getting back to you. Bee pollen and mesquite powder can both be bought at good health food shops. Our local organic shop used to sell bee pollen, but sadly closed down last year. My mother mixes it into her muesli. Hi Elizabeth, I would have thought dates, cashews and cocoa would work absolutely fine – you probably wouldn’t need to add the water though. I love dates and these look superdelicious (though I’d leave out the bee pollen). Thanks for sharing the recipe! The beauty of these is that you can make them as simple or as complicated as you like. They’d be fine with just dates, cashews and cocoa. These look great! And date and banana sandwiches sound pretty fab, too!